Why enjoy Half Off Arcade Play just one day a week, when you can enjoy it every weekday at Big Al’s! 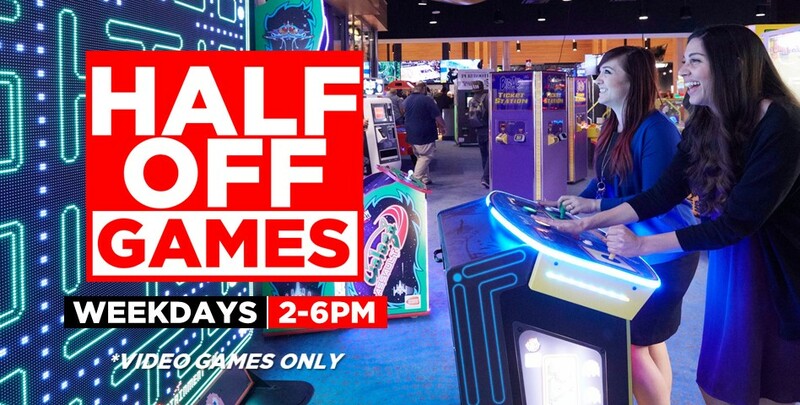 Join us for our Half Off Happy Hour in the Arcade and double your fun with half-price video games from 2-6PM Monday-Friday!! Yep, take Jurassic Park motion to the VERY end for a fraction of the cost. Or, leverage any dance game for your daily workout at half the price! All of our video games are yours to enjoy for half off M-F 2-6PM! *please note that redemption games, token machines, and merchandise games are excluded.